Venus: "It Was A Tough Match For Her, Because I'm Kind Of A Floater Right Now"
EASTBOURNE, England — Venus Williams took delayed revenge for a match she had to abandon nearly five months ago by beating eighth seed Andrea Petkovic 7-5, 5-7, 6-3 at Eastbourne on Monday. The unseeded Williams carries a number 32 world ranking after last competing on January 21 in the Australian Open third round, when she had to quit after one game against the German due to an abdominal injury. 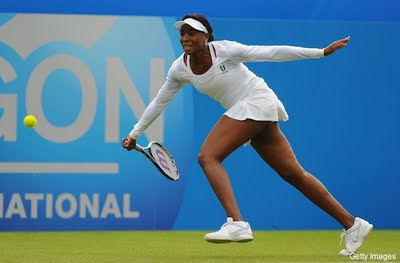 Along with her sister Serena -- out for the past year following her 2010 Wimbledon title due to a cut foot and blood clot issues in her lungs -- Venus is making a low-key warm-up for Wimbledon, which starts in a week. "It was definitely an adventure today: the conditions, falling down every other point," said Williams. "(It was great) just coming back from such a long layoff, competing against someone who has been playing so well in the last 12 months. "There was definitely a lot going on out there, but I was extremely excited to come back with a win." Petkovic went a break up in the first set but could not hold it as the experience of Williams, who turns 31 on Friday, paid dividends. The world number 11 German salvaged the second set to level the match after clawing back a break from Williams, only for the American to raise her game in the third set to secure a comeback victory in two hours and 35 minutes. "It was very interesting when I drew her," said Williams, who last played Eastborne 13 years ago. "It was a tough match for her, because I'm kind of a floater right now. 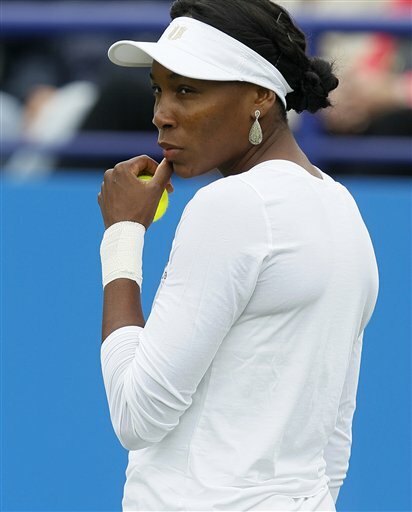 "Normally she would probably get through the first round. That was a little bit of bad luck for her, but for me it was a great opportunity. "It felt fitting in a way, very ironic - but a great way to start it all off." Williams next plays the winner of the match between German Julia Goerges and former world number one Ana Ivanovic of Serbia at an event featuring seven of the WTA top 10.